Category: Appetizers - Kaci and the World. On Saturday night, my family hosted a "tornado shower" for our relatives who lost their home in the Joplin tornado last spring. Over sixty people attended, and my aunt and uncle took home a Suburban-full of fun things for their new home, which is under roof. I am, of course, going to talk about the food! We had so many people that almost everything was catered. The majority came from Whole Foods, but we had a few things from local restaurants, like mini bbq brisket sandwiches from Lester's. Yum! 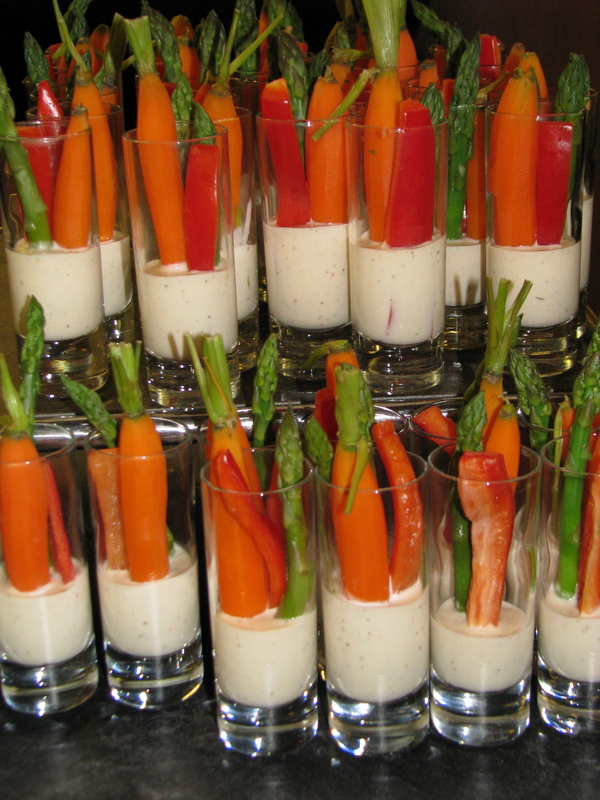 How awesome are those veggie shooters?! My mom found the idea on Pinterest (hey, I'll give credit where credit is due, but I think ours look even prettier). If you want to try this yourself, buy a bunch of shot glasses, fill them with about a tablespoon of ranch dressing, and add some colorful vegetables. We quickly steamed the asparagus and green beans, and used raw bell peppers (orange, yellow and red) and jicama. Voila! Party-ready. These are the shrimp and pork spring rolls from Mai Lee. Classic McAllister family party fare. I wish these were homemade, but they were (mostly) not. They came from Sugaree bakery and yes you should be jealous that you did not get any. (Unless you were at the party, and then you can back me up.) The selection included fudge truffles, chocolate-almond macaroons, raspberry thumbprints, and lemon triangles. Sprinkled in the mix were my White Chocolate S'more Bars (see below), which I might add were the fastest to go! Preheat the oven to 350 degrees F. Line an 8x8 inch baking pan with foil and spray generously with cooking spray. Be careful when you're lining the pan that you really get the foil to go all the way to the bottom of the pan ... Pans with round corners are not advisable. (But if you use a glass pan, like I did, and the foil doesn't go down all the way, your bars will be fine. Just a little lop-sided.) Make sure the foil goes all the way up over the edges of the pan, because these bars are s-t-i-c-k-y. Combine the cake mix, egg, and butter in a large mixing bowl with your hands until a soft dough forms. Press half of the dough into the bottom of the prepared pan. Place the graham crackers on top in one layer, add the chocolate chips, and then add the marshmallows. Top with the remaining dough and press evenly to cover. (It doesn't matter if you don't have enough or it's not totally even.) Drizzle the condensed milk on top and bake for about 30 minutes, or until the center has mostly set and the top is lightly browned. Let cool for 5 minutes and then run a plastic knife around the edges to loosen the marshmallow (I wish I had read this step when I made them). Cool completely, and then remove the bars form the pan using the foiled edges. Cut off the edges if desired (for prettier bars), cut into squares and serve at room temperature. *If you want to give your arteries a little extra lining, you could try using two boxes of yellow cake mix--one for the top and one for the bottom. When I made these, I felt like I didn't have enough for the top. They turned out just fine, but I'm sure extra yellow cake would not be a bad thing. Unless you are at risk for diabetes, in which case I will have to recommend that you leave this recipe alone. Sorry.